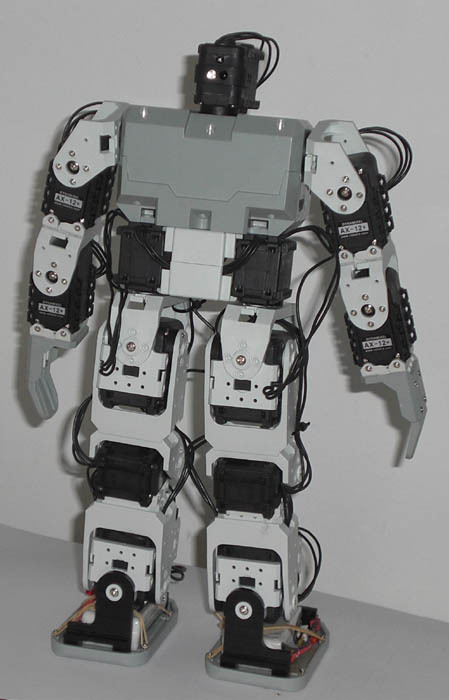 Having studied some of the many humanoid robot kits I decided on the Bioloid. This was mainly due to the fact that the servo's were on a 1mb bus which not only means they can be updated more quickly but they can also send back positional and other information. Also unlike the other kits the Bioloid can be made into many other robots such as spiders, dinasaurs and even wheeled robots. The kit took a few hours to build and I was most impressed with the way it went together. I have sinced modified it to put lithium polymer batteries in the feet to keep the centre of gravity lower and reduce the overall weight. At the moment the project is shelved as I have to many projects on the go and was not getting any completed.